The transmission and distribution sector can expect private sector investments of nearly Rs.300,000 crore over the next four years, Power Minister Piyush Goyal said on Wednesday. "If we get transmission and sub-transmission right, I see no reason why the promise of 24x7 power can't be met. The missing link is transmission and distribution," Goyal said while inaugurating the Gridtech international conference here organised by Power Grid Corp."With the new technologies we are bringing in, we will now create an ambitious grid programme which will meet the country's demand," he added. The minister said that the Rs.300,000 crore investment from the private sector will be supported by over Rs.100,000 crore from the government through schemes such as the Deen Dayal Upadhyay Gram Jyoti Yojana and the Integrated Power Development Scheme. "Wherever the grid can reach, it will reach and where it can't reach off-grid solutions will be utilised. 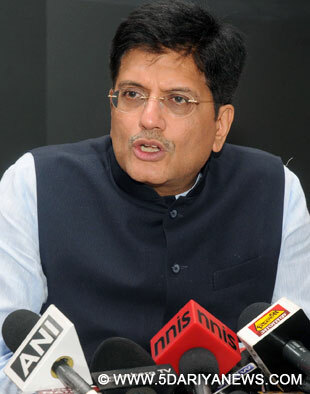 I urge the department, supported by all stakeholders, to prepare a plan for the short term, medium term and the long term, on how to provide the poor with power at affordable rates," Goyal said.In 2014-15, 20,000 km of transmission lines were added in the country, which is the highest ever, he added.